If you're a big person, you can enjoy horseback riding as long as the horse is suited to your size and riding abilities, your riding position is balanced and you have a well-built saddle that fits both you and your horse. Saddles must fit the horse first, but they also must be comfortable for the rider. Both English and Western riders can find saddles to accommodate their size and height. The saddle size itself must be big enough so that the rider can sit comfortably. 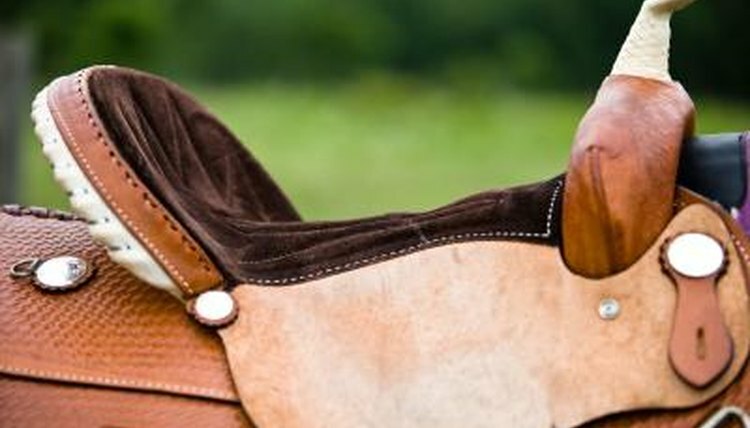 On a Western saddle, the seat size is measured from the top of the cantle to the hole right in front of the saddle horn. Western saddles also take into account the cantle height and skirt length. English saddles are measured from the pommel to the cantle. Your saddle size will vary from English to Western saddles, with seat sizes in Western saddles an inch or two smaller than similar sizes on English saddles. English saddles include all purpose, flat or jumping, dressage and saddle seat. Big riders can choose any of these saddle types, depending on their riding discipline. Flap length varies among saddle markers and should be taken into consideration for tall or big riders. A longer flap can provide more security for a larger rider. A big or tall rider probably will need an English saddle of at least 17 inches. Western saddles come in a range of sizes including varying seat sizes, cantle heights and skirt sizes. Big riders may find that saddles with lower cantles are easier for mounting and dismounting than other saddle types. Large riders will require a Western saddle with a 17 inch seat or larger. It can be more challenging to find used saddles for big riders. Saddle markers tend to produce more saddles in smaller sizes than larger sizes. When shopping for used saddles, check the seams, sticking and girth buckles carefully, making sure that they are in good condition. Plus-sized riding communities such as Eighteen Hands may be able to help you find a used saddle that fits both you and your horse.